Medium (7-8) - $53.99 Only 1 left! Any time that rush of nostalgia hits you, it’s tough to avoid smiling and thinking back to some of the toys that we used to have that have gone vanished over the years. One of us in the office can clearly remember having a particular toy: a weird little noise-making thing that nobody remembers the actual purpose thereof. It went in a drawer one day and just disappeared. Naturally, we all suspect the parents. He suspects something a little more adorable. When you’ve worked hard to raise your own little hero, how better to dress them up than a little hero of their own? Let your tyke step up to the big time with this Child Deluxe Woody costume. 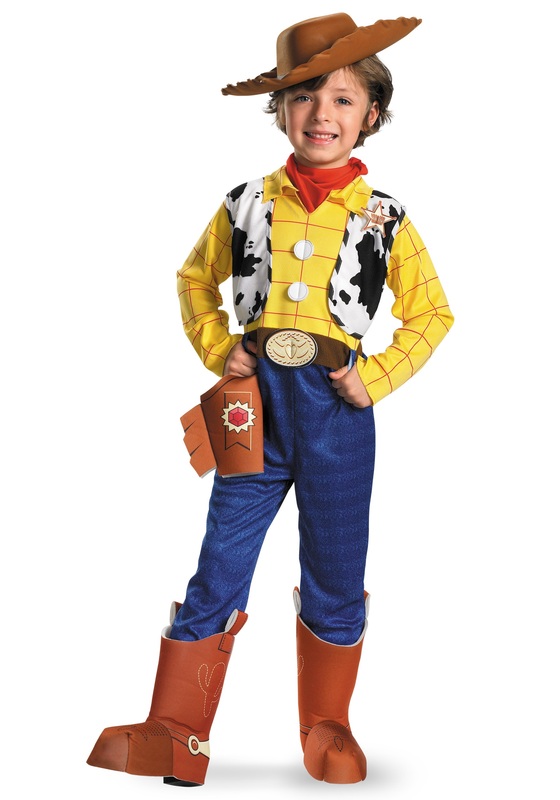 This interlock jumpsuit fastens with Velcro and has the perfect color and fabric combinations to give your kiddo the exact look of the epic Cowboy, himself. The flannel vest are sewn to the side panels of the shirt with the sheriff badge embroidered on the left lower shoulder. The triangular red bandanna can be tied around the neck and the foam boot covers have cactus print and faux spurs. Oversized stitching in the hat gives the cartoonish look needed for such an adorable character. Now you just need to find a horse and lasso to go with and your tyke’s adventuring days in the Toy Cabinet are just beginning.